Archive for the ‘Product Reviews’ Category. I’ve been using Boomerang for Gmail for the last 5 years (previously) and it is still the most useful part of my email. It’s my auxiliary brain. What do I do with it? Recommendation for Compact Washer and Dryer. We may be replacing our compact (24″ wide) stacked washer dryer very soon. We have a vent. Can you recommend any particular models? I long for when I used to have a tiny apartment washing machine. That was a completely awesome appliance! But no use in looking back, I’m a family man now! The Cards Against Humanity folks are the best! They created the Donald Trump Bug Out Bag. 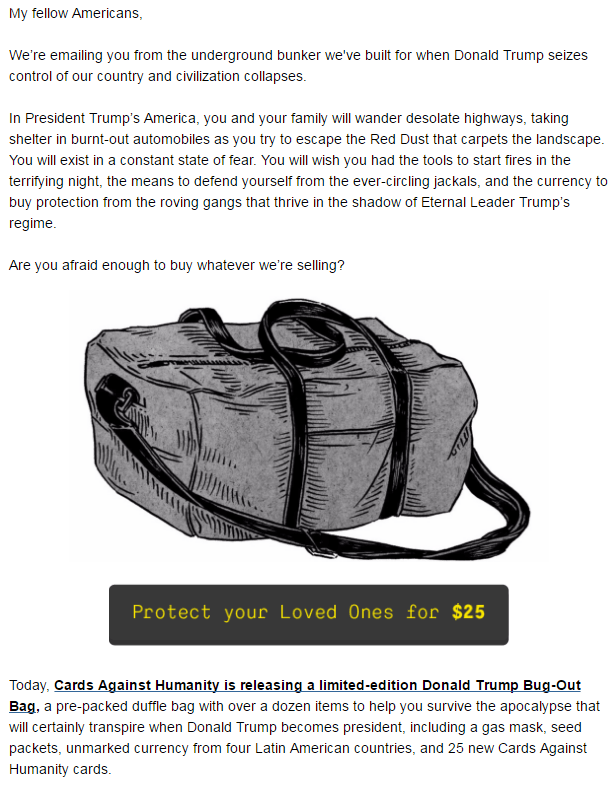 The most wonderful thing is that they actually sold 10,000 Trump bug-out bags. It’s this beautiful money-where-your-mouth-is comedy thing… or is it comedy? Is it? Megan got me a remote control switch set for Xmas. It works great. 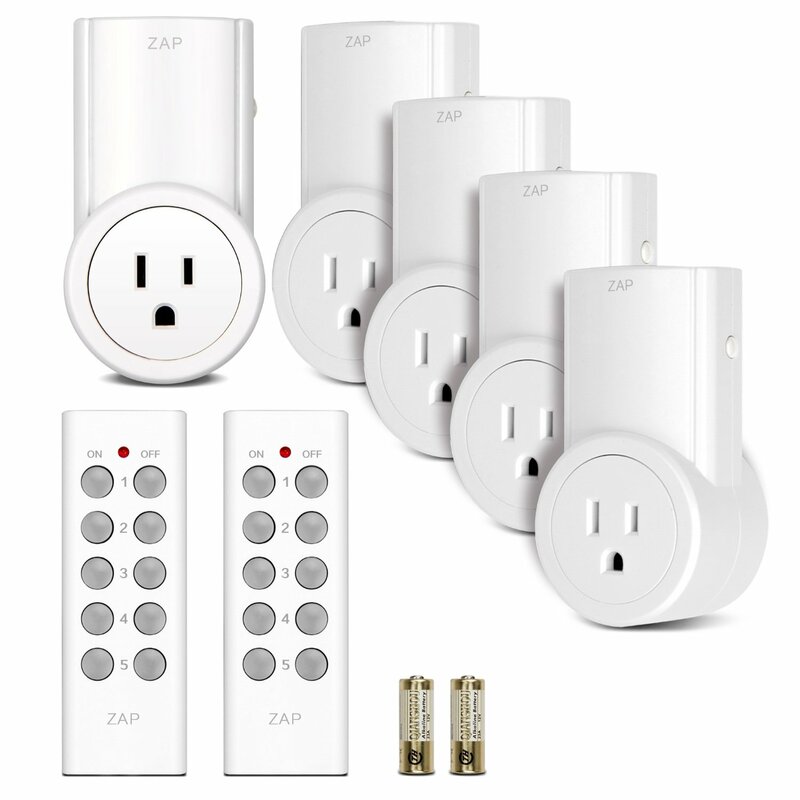 – Note: the outlets are pre-programmed for immediate use, but the configuration can be customized to meet your needs. – Plug the outlet switch into a socket and turn it on. – Press and hold the programming button on the right side of the outlet until the LED indicator begins to flash. – Release the programming button and then press the desired On or Off button on the remote. – The pairing is successful when the LED indicator stops flashing. – Remove the outlet from the power socket. – Press and hold the programming button. – Plug the outlet back into the power socket while continuing to hold the programming button. – Hold the programming button for approximately 5 seconds until the LED indicator begins to flash. – When the LED flashes rapidly several times and stops, the outlet has been reset. While it may be commonplace in most Asian countries, the cultural norm of taking your shoes off before entering your home has yet to catch on in Europe and America. In Asian cultures it’s easily understandable as to why people remove their shoes before coming into a home as their meals are typically eaten on mats on the floor, and they sleep on rolled out futons at night. A new study has researchers suggesting that maybe we might want to be more aware of what exactly we’re bringing into our homes via our shoes. Bacteria in the home – Research conducted at the University of Houston found that 40% of shoes were carrying around the Clostridium difficile, or “C.diff”, bacterium. Infections caused by C.diff are highly resistant to antibiotics, which can lead to difficult and lengthy recovery times for anyone who becomes infected. C.diff is also able to survive in most areas of the household, including toilets, tops and surfaces, and wherever floor dust is found. Ready to take off your shoes yet? Kinda scary, right? I’m always going to take my shoes off at home so me and my baby don’t get sick! The trouble is, the article intentionally sensationalized and misrepresented the results of the research. I read the research paper. The data and conclusions of the research did not match what the article implied. To paraphrase, the research said, “C.diff can get you sick. 1/3 of all our samples in homes had that bug on them. 40% of shoe bottoms had it, 30% of bathroom surfaces, 30% of floor dust. Wow, that’s a lot… we think… maybe.” And that’s where they left it. So my takeaway is: don’t lick the bottoms of my shoes, the floor, or my toilet. Thanks for the tip, guys. If they had compared rates of contamination in the different areas of the house, they might have come to some great conclusions. For example, maybe people that have shoe bugs are more likely to have bugs elsewhere in the house (IE, maybe people track the bugs in on their shoes) . Or maybe not. They’ve got the raw data, why didn’t they crunch the numbers? They didn’t have a control group. They said that floor dust was contaminated, was tabletop dust contaminated too? Maybe if they had tested silverware, frozen pizzas, and kitchen tables they would have had the same 30% contamination rates. But we’ll never know because they did bad science. I know all about bad science, I did some just last month. Frickin’ grad students and their research projects. Frickin’ sensationalist websites and their fear mongering. You can find the abstract (a short summary) of the research here. You can find the full paper via a library that has access to scholarly journals. I used my San Jose State University library access. 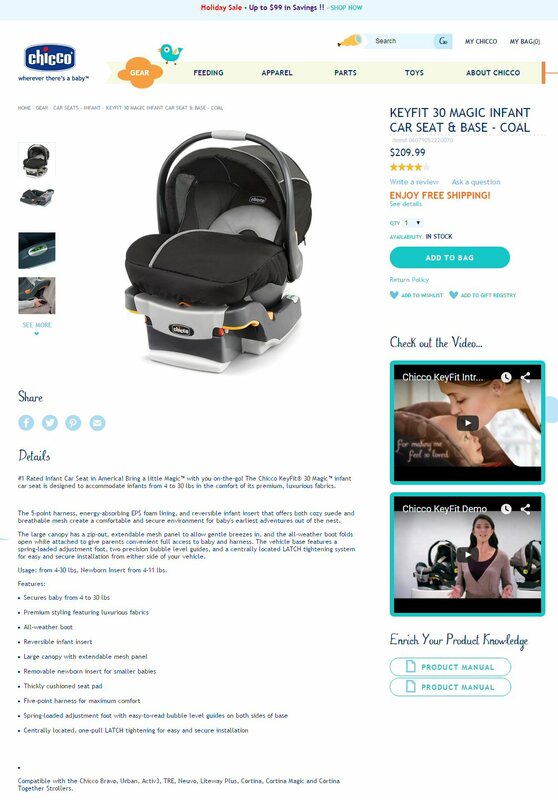 Advertising for the Chicco Keyfit 30 Car Seat is intentionally deceptive. You might be thinking, “Yeah, whatever, that is a small matter.” No, it isn’t. The average baby outgrows the car seat by weight when they turn 30 months (2 1/2 years) old. But the average baby outgrows the car seat by height at 12 months old! (see the CDC height and weight tables) Our baby was 30″ tall at 9 1/2 months! The manual dictates that the product lasts 60% less than its marketing claims. That is deceptive advertising. Imagine buying a car that had a 10 year, 40,000 mile warranty! Would you feel cheated? The Amazon ad doesn’t mention this height restriction either (local archive). We’ve had our Chicco Keyfit 30 Car Seat for a few months now and it has performed well. But our daughter outgrew it more than a year and a half sooner than we were led to believe by Chicco. It is a fine product, they don’t need to stoop to this deception. This deception is dangerous for children because if you were to only read the marketing information, you might use this seat long after it was safe to do so. Lee.org by Lee Sonko is licensed under a Creative Commons Attribution-Noncommercial 3.0 United States License. In short, you can copy and share what I've written as long as you tell people you found it here but you can't make money from it without my permission.